Two star-forming regions in the Milky Way shine in this photo taken by a telescope in Chile. A telescope in the Southern Hemisphere captured an amazing view of two star-forming regions in the Milky Way. The European Southern Observatory released the photo of the star cluster NGC 3603 and NGC 3576 nebula shining in the southern Milky Way today (Aug. 20). While the two cosmic objects are separated by about 10,000 light-years, they appear to glow with similar brightness in the new photo taken by ESO's La Silla Observatory in Chile. The beauty of the photo is also on display in a cosmic fly through video released by ESO. "NGC 3603 is a very bright star cluster and is famed for having the highest concentration of massive stars that have been discovered in our galaxy so far," ESO officials said in a statement. "At the center lies a Wolf-Rayet multiple star system, known as HD 97950. Wolf-Rayet stars are at an advanced stage of stellar evolution, and start off with around 20 times the mass of the sun." While Wolf-Rayet stars might be huge, they are still bombarded by stellar winds, which carry material from the star's surface into space at millions of kilometers per hour, according to ESO. NGC 3603 is an active star-forming region. 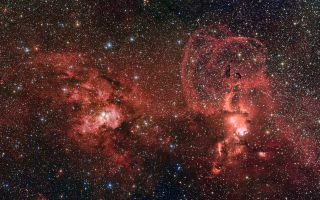 The ESO photo reveals clouds — called HII regions — glowing with the light of young stars that formed within the cluster. "HII regions shine because of the interaction of ultraviolet radiation given off by the brilliant hot young stars with the hydrogen gas clouds," ESO officials said. "HII regions can measure several hundred light-years in diameter, and the one surrounding NGC 3603 has the distinction of being the most massive in our galaxy." This wide view shows the region around the star cluster NGC 3603, located about 20,000 light-years from Earth. The NGC 3576 nebula — the other cosmic object shining with NGC 3603 in the new image — is also an interesting star-forming region of the Milky Way. The stellar wind from the young stars in the nebula have sculpted gas and dust into two objects that look like ram horns that stretch across 100 light-years. The curly "horns" can be seen on the right side of the picture. NGC 3576 also plays host to two Bok globules that appear like dark clouds near the top of the right-hand side of the photo. "These black clouds near the top of the nebula also offer potential sites for the future formation of new stars," ESO officials said.